British foreign minister Boris Johnson says 'It is very important to try first to get out UN resolution' before any unilateral action in Syria. 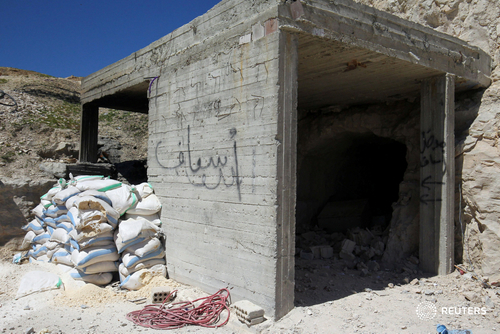 Turkish justice minister says autopsies reveal that chemical weapons were used in attack on Syrian town in Idlib. U.S. President Donald Trump accused Syrian President Bashar al-Assad's government of going "beyond a red line" with a poison gas attack on civilians and said his attitude towards Syria and Assad had changed, but gave no indication of how he would respond. Vice President Pence tells Fox News 'all options are on the table' following Syria gas attack, adding that the 'time has come' for Russia to meet obligation to eliminate chemical weapons in Syria. Russia denied on Wednesday that Syrian President Bashar al-Assad was to blame for a poison gas attack and said it would continue to back him, widening a rift between the Kremlin and Donald Trump's White House, which initially sought warmer ties. Russia said former U.S.President Barack Obama's threat of military action if a "redline" was crossed and chemical weapons were used in Syria had provoked such attacks. Trump calls chemical attack in Syria 'terrible affront to humanity"
U.S. President Donald Trump on Wednesday described a poison gas attack in Syria as "horrible" and "unspeakable" and called it a "terrible affront to humanity." 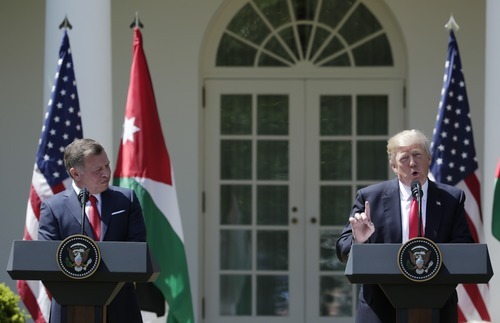 Asked during a meeting with Jordan's King Abdullah in the Oval Office whether he was formulating a new policy towards Syria, Trump told reporters: "You'll see." 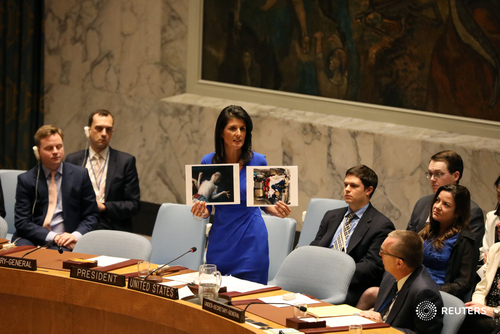 WATCH: U.S. envoy to U.N. Haley says Assad has no incentive to stop using chemical weapons unless Russia stops protecting him. 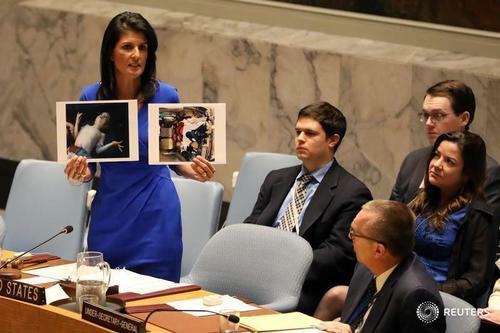 U.S. envoy to U.N. Haley says Assad has no incentive to stop using chemical weapons unless Russia stops protecting him. Deputy Russian UN envoy says Obama's red line on Syria chemical weapons was starting point for 'terrorists' to provoke military force against sovereign state. Russia denied on Wednesday that Syrian President Bashar al-Assad was to blame for a poison gas attack and said it would continue to back him, setting the Kremlin on course for its biggest diplomatic collision yet with Donald Trump's White House. 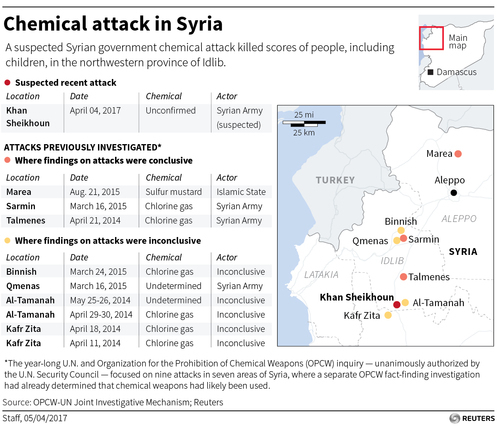 ReutersMedical charity Medicins Sans Frontieres said on Wednesday eight people it treated following a suspected chemical attack in northern Syria had symptoms consistent with nerve agents like Sarin. ReutersRussia will argue at the United Nations that an apparent chemical attack that left scores dead in Syria was in fact contamination caused by rebels' chemical munitions, Kremlin spokesman Dmitry Peskov said on Wednesday. The chemical attack in Syria's northwestern Idlib province killed more than 100 people, Turkish President Tayyip Erdogan said on Wednesday, without saying where the death toll number came from. Erdogan, who was speaking at a rally in the northwestern province of Bursa, also called Syrian President Bashar al-Assad a "murderer". Ankara has long been one of Assad's most steadfast critics and has repeatedly called for his ouster. 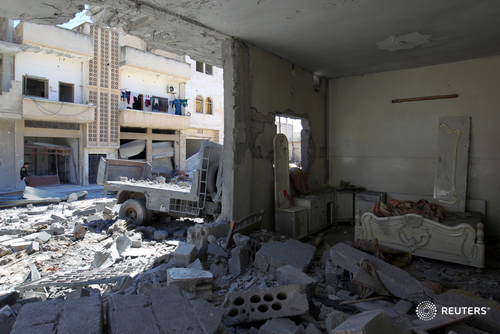 Western countries, including the United States, have blamed Assad's armed forces for the chemical attack that choked scores of people to death in the town of Khan Seikhoun in a rebel-held area of northern Syria on Tuesday. 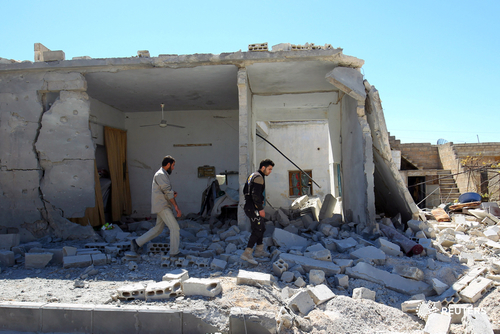 Russia, which backs Assad, denied on Wednesday the Syrian president was to blame for the attack, and said it would continue to support him. Around 270,000 Syrians in Germany have the right to bring in their family members, a newspaper said on Wednesday - a statistic that could fuel the debate about migration less than six months before a national election. Britain and France on Wednesday renewed their call for Syrian President Bashar al-Assad to leave office, after a suspected chemical attack by Damascus killed scores of people in a rebel-held area, eclipsing an international conference to promote peace. A proposed United Nations resolution on a chemical weapons attack in Syria is "unacceptable" for Moscow and based on "fake information", Russia's Foreign Ministry spokeswoman Maria Zakharova said on Wednesday. Russia foreign ministry says Lavrov, Tillerson to discuss Syria, North Korea and Ukraine in Moscow. JUST IN: Turkish President Erdogan says city of Manbij is next step in Syria. U.S. President Donald Trump on Tuesday condemned a Syrian chemical weapons attack that killed dozens and blamed Syrian President Bashar al-Assad, but did not say how he would respond despite calls from France for stronger U.S. leadership. Medical charity Medicins Sans Frontieres said on Wednesday eight people it treated following a suspected chemical attack in northern Syria had symptoms consistent with nerve agents like Sarin. 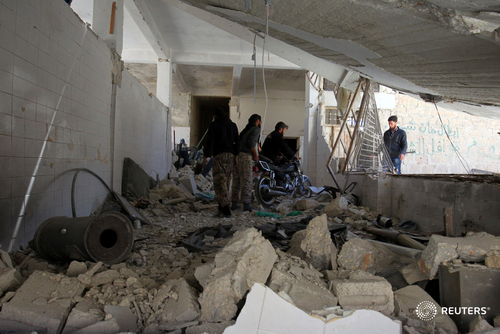 "Among the victims of the attack on the town of Khan Sheikhoun who were transferred to the Bab al-Hawa hospital ... near the Turkish border, MSF saw eight patients with symptoms - dilated pupils, muscle spasms, involuntary defection - consistent with exposure to neuro-toxic agents such as Sarin," the group said in a statement. 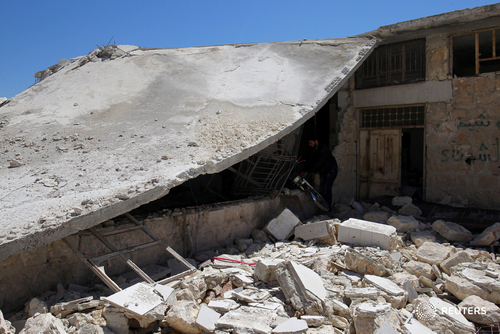 MSF, which has teams at the hospital, said it had provided antidotes and protective equipment for personnel on site. 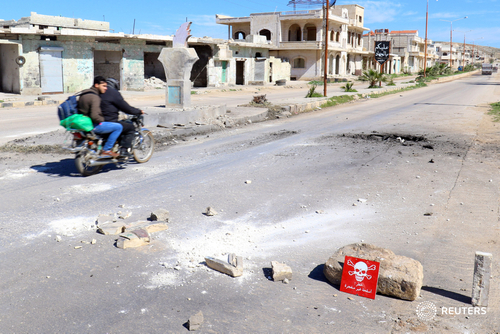 "The MSF team also accessed other hospitals treating victims and noted a strong smell of chlorine, suggesting they had been exposed to this toxic agent," MSF said. ReutersBritain and France on Wednesday renewed their call for Syrian President Bashar al-Assad to go, after a suspected chemical weapons attack by Damascus killed scores of people in a rebel-held area. Russian Foreign Minister Sergei Lavrov said on Wednesday that Moscow's position on Syrian President Bashar al-Assad remained unchanged.